This article contains an overview of the history of the rise of the Democratic Party, its origins, leaders, presidents and their beliefs. Summary and Definition of the Democratic Party: The Democratic Party is one of the two major political parties in the United States of America, the second group being the Republican Party. There have been 15 Democratic presidents. The origins of the party date back to the ideals of Thomas Jefferson but the founder of the modern Democratic Party was Andrew Jackson. The origins of the Democratic Party dated back to the political beliefs of Thomas Jefferson during the political era of the Federalists and Anti-Federalists. The Anti-Federalists were led by Thomas Jefferson and believed that the vast majority of ordinary, less educated people, had the common sense and the skills required to run the new government as opposed to the Federalist view that the central government should be run by the wealthy and well-educated classes. The Anti-Federalists called themselves Republicans (not to be confused with the modern Republicans) in opposition to the Federalists. The Anti-Federalist party was re-named as the Republican Party in 1792, reflecting the ideals of Republicanism supporting states’ rights and a strict interpretation of the Constitution. The Anti-Federalist Republicans are sometimes referred to as the Jeffersonian Republicans to avoid confusion with the modern Republican Party. Their name was based on the concept of Republicanism meaning a political values system that emphasizes the ideas of liberty and "unalienable" rights as their central values, rejecting aristocracy, corruption and inherited political power. The Jeffersonian Republican Party supported states’ rights and a strict interpretation of the Constitution. The Federalists tried to discredit the Jeffersonian Republican Party by alluding to them as Democratic-Republicans hoping to convey the extreme and radical actions taken in the name of democracy during the French Revolution. However, the Jeffersonian Republicans admired the strong anti-monarchist sentiments of the French and their beliefs in the principle of government by the people - so the name "Democratic-Republican" stuck. The Jeffersonian Republicans therefore became members of the Democratic-Republican Party. Thomas Jefferson became the leader of the Democratic-Republican Party, and was elected the third president of the United States in 1800. The Democratic-Republican Party adhered to the Constitution in order to limit the powers of the federal government and was strongly opposed to corruption and elitism and the aristocracy. Jefferson was supported by the most influential politicians in the South and the party emerged a coalition between Southern agrarians (farming communities) and Northern city dwellers. The leaders included James Madison, James Monroe, Aaron Burr, George Clinton, Benjamin Rush and Albert Gallatin. Thomas Jefferson, James Madison, James Monroe and John Quincy Adams were all Democratic-Republican Party presidents. What caused the formation of the Democratic party? It was formed when the Democratic-Republicans split into two political parties during the presidency of John Quincy Adams. The first splinter group of Democratic-Republicans was led by John Quincy Adams and Henry Clay, and adopted the name National Republican Party, which would later evolve into the Whigs. The second faction of Democratic-Republicans was organized by Martin Van Buren and led by Andrew Jackson. In 1828 the Andrew Jackson's Democratic-Republican supporters dropped the word "Republican" from their name and simply called themselves Democrats - the Democratic Party we know today. The founder of the modern Democratic Party was therefore Andrew Jackson who established a strong, solid Democratic party system. Andrew Jackson established an efficient Democratic political organization by forming committees at the local, district, and state levels. Political rallies and national conventions were organized generating valuable publicity and attracting new voters. He also backed the newly created national convention system for nominating presidential candidates that enabled local input in the political process. The conventions were forums for debate and also deal making which led to Jackson's support of the Spoils System. President Andrew Jackson was portrayed as a jackass (a donkey) by political satirists during the 1828 election campaign in an an attempt to portray the Democratic Party president as a stupid person. However, Jackson turned this image to his advantage on his campaign posters to convey his strong will and persistence. In 1870 the famous cartoonist, Thomas Nast, again used the donkey in a cartoon in Harper's Weekly. 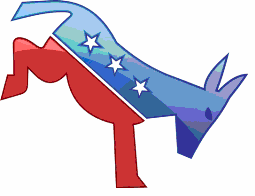 The donkey caught the imagination of the public and it became the unofficial symbol of the Democratic party. Alliances became more difficult within the Democratic Party. Relations between northern and southern Democrats became increasingly strained. The northern states favored protective tariffs (taxes on imports) to safeguard their manufactured goods. Southern states sought the reduction of tariffs, some suggesting that individual states could nullify federal tariff laws which led to the 1832 Nullification Crisis. The Democratic Party achieved success with the elections of Martin Van Buren, James K. Polk, Franklin Pierce, and James Buchanan. However, during this period political debate increasingly centered on the bitter question of slavery that was dividing North and South. The issues of States' Rights and Slavery provoked a regional split within the party which widened still further over the designation of new territories as free states or slave states. The election of 1852 saw the demise of the Whig Party and the emergence of the anti-slavery Republican party in 1854. The Democratic Party then split into two groups due to the issue of slavery. The two Democratic Party factions were the Northern Democrats and the Southern Democrats. The 1860 national convention proved to be the breaking point for the split. The southern Democrats favored John C. Breckinridge, and the northern Democrats favored Stephen A. Douglas. The Republican candidate, Abraham Lincoln, capitalized on the split in the Democratic Party and won the election partly as a result of the Lincoln-Douglas Debates. After the election of Abraham Lincoln, the Democratic Party saw the rise of a faction in the south that became known as the Fire-Eaters. The Fire-Eaters were an group of extremist pro-slavery politicians from the South who urged the separation of southern states into a new nation, which became known as the Confederate States of America, or the Confederacy. Their leader was Robert Barnwell Rhett of South Carolina and his supporters wanted to reopen the international slave trade. The influence of the Fire-Eaters led to the outbreak of the American Civil war (1861-1865). The Secession of the South resulted in the establishment of the Confederate States of America. The Confederacy was formed in February, 1861 and was composed of the 11 Southern states that seceded from the United States in order to preserve states' rights and slavery. The eleven Southern states were Alabama, Arkansas, Florida, Georgia, North Carolina, South Carolina, Texas, Virginia, Tennessee, Louisiana, and Mississippi. The government of the Confederate States of America was directed by Jefferson Davis as president, with Alexander H. Stephens as vice president. The establishment of the Confederacy unleashed the American Civil War of 1861 - 1865. During the Civil War many Democratic Party members were openly sympathetic toward the South and the Confederacy. The Southern Democrats had led the drive to secede from the Union and form the Confederate States of America. Southern Democrats were pro-slavery and promoted its expansion into the West. During the Civil War, no party politics were allowed in the Confederacy. Northern Democrats divided into two factions, the War Democrats, who supported the military policies of President Lincoln, and the Copperheads, who strongly opposed them. The faction of Peace Democrats, also called Copperheads, emerged in the north opposing the Civil War. The anti-war Copperheads called for an immediate peace settlement with the Confederates. After secession, the Democratic vote split between the War Democrats and the Peace Democrats. The War Democrats voted for Abraham Lincoln in 1864. Democratic Party History: Reconstruction and the "Solid South"
In the post civil war years the Republicans attempted, with some success, to brand the Democratic Party as the party of rebellion. The Southern leaders of the Democratic Party associated the defeat of the South and Reconstruction with the Republican party. The South became solidly Democratic in response to the unpopular Reconstruction policies of the Republicans. The strength of feeling and resentment of the 11 Southern Democrats in the old Confederacy continued for many years. The South voted Democratic, with few exceptions until the 1960s, giving rise to the term the "Solid South". The "Solid South" is used to describe the electoral support of the Southern states for Democratic Party candidates from 1877 which was the end of Reconstruction right up to 1964 with the passage of the Civil Rights Act. In the post civil war period the Republicans continued their ascendancy with the election of Ulysses Grant, Rutherford Hayes, James Garfield and Chester Arthur as Republican Presidents. The Republican Presidents were in office from 1869 to 1885. Grover Cleveland broke the Democratic Party drought and was elected for two terms as president from 1885 and again in 1893. The next Democratic Party president was Woodrow Wilson who was elected in 1912 and 1916. Woodrow Wilson introduced his New Freedom policy beginning the shift of the Democrat Party as being advocates for states rights to the idea of federal (national) power. Franklin D. Roosevelt was elected representing the Democratic Party for four terms as president in 1932, 1936, 1940, and 1944. FDR continued the policy of Woodrow Wilson and completely shifts the Democratic Party to the benefits of federal power. Harry Truman was elected president representing the Democratic Party in 1945 and again in 1949 but the Democratic Party once again splits into northern democrats and southern democrats. The idealistic and charismatic John F. Kennedy was elected as the 35th president of the United States in 1961. He represented the Democratic Party and crusaded for labor reform, and became increasingly committed to civil rights legislation. His assassination on November 22, 1963 led to the inauguration of his vice president Lyndon B. Johnson. Lyndon B. Johnson was president 1963-1965 & 1965-1969. During the LBJ Democratic administration the 1964 Civil Rights Act is passed which makes the Democratic Party more popular among the Black electorate. Jimmy Carter became the next Democratic president in 1976 following the Watergate Scandal of Richard Nixon. The popular Bill Clinton started his term as Democratic president in 1993 and his administration sees a boom in the economy. His term in office ended in 2001 and was marred by scandals involving Whitewater and Monica Lewinsky. Barrack Obama was elected as the first Black American president representing the Democratic Party in 2009 and was re-elected in 2013. His term as president ends in 2017. There have been 15 presidents that have represented the Democratic Party. The following table provides details of all the Democratic Party Presidents. The article on the History of the Democratic Party provides a fast overview of the history of the US Government. The following Presidents of the USA video enables you to sit back and listen to the history of all the Presidents of the USA - a useful educational resource for kids, children and schools that complements the information found in the History of the Democratic Party.